Find the best and cheapest motorhome rental deals with Aussie Campervans. We offer a very convenient booking service which gives you an opportunity to hire the best motorhome that suits your requirements. Online bookings help in saving huge amount of money and no hidden fee is charged later on as you can see all the details while booking your vehicle. If you are looking for campervan rental companies in Adelaide, then you are in the right place as we offer a wide range of campervans and 2WD motorhomes on competitive rates which can manage all your travel needs. In addition, to that, we keep an eye on our competitors rates in order to provide best deals to you. Start your search and compare the best motorhome rental deals in Adelaide. If you want to find an ideal motorhome that matches your budget requirement then you must view our motorhome webpage. We are sure that you will definitely find what you are looking for. Rent a Motorhome from Adelaide and explore the Clare and Barossa wine regions, across to Kangaroos Island or Australias Outback, including the Flingers Ranges. Welcome to Adelaide, the city of churches and gateway to the wine country. The capital city of South Australia, Adelaide offers many great attractions and is voted one of the top 10 must visit cities for 2014 by Lonely Planet. Situated on the bank of Torrens River and bordered by the Mt Lofty Ranges to the east and the Gulf St Vincent to the west, the city boasts of plentiful spotless beaches, live music, art galleries, grand cultural heritage, historical buildings, wine regions, cafes, churches and festivals that are celebrated all the year round. Explore the Adelaide Central Markets and take a gastronomic tour and taste the many delights from many produce stalls. The Market is open from Tuesday to Saturday every week and you will find a huge range of fresh food, all under one roof. Go to the market and get all your provisions and stock up the fridge in your motorhome before you start your self-drive holiday in South Australia. Get close and personal with the Pandas at the Adelaide Zoo. Join the tour and meet Wang Wang and Funi (the only giant pandas in the southern hemisphere) for a behind the scenes experience. Finish off the day visiting the rest of the zoo with its 300 or more native and exotic species, with over 1,800 animals on site. There are enclosures providing visitors the jungle experience with Sumatran Tigers and Orangutans. Take a motorhome rental drive up to Handorf, Australia’s oldest surviving German settlement in the Adelaide Hills. There is still a strong German influence in the area with a number of smallgoods outlets and German bakeries in the main street. You can pick strawberries (in season) at Beerenberg and the young ones will enjoy a day with the friendly animals at Hahndorf Farm Barn, part farmyard and part nature wildlife park. The Barossa Valley is famous for its wineries and gourmet produce. This region is surrounded by vineyards and there are more than eight wineries on its doorstep and many more just a short motorhome drive away. Enjoy the cellar door tastings and sales and dine at the many local restaurants where fresh local produce is matched with delicious local wines. Drive your motorhome hire vehicle to the Barrossa Valley and enjoy. Every 2 years the biennial Barossa Vintage Festival (largest and longest running wine tourism festival) is held during Easter. This festival features the rich diversity of the Barossa region and celebration of wine, food, music, art and culture with many events staged over the long holidays. Highlight of the festival is the Grand Parade featuring over 100 decorated floats. Kangaroo Island is Australia's third largest island. Drive your rental motorhome south to Cape Jervis for a short 45 minutes ferry from the mainland. Four daily departures with additional services during peak season. Board your motorhome hire onto the ferry and spend a few days to discover this wildlife sanctuary with its natural and rugged scenery. Kangaroo Island vast 2250 square kilometres has been spared the damage from the impact of European settlers plus due to lack of predatory animal i.e. foxes and rabbits – the animal and bird populations thrived in this region. There are several conservation parks where you will discover New Zealand fur seals and Australian sea lions and koalas all in a protected natural environment. Every first Sunday of the month there is a Farmers market run by local food producers where you can purchase a range of local produce from the producers themselves. 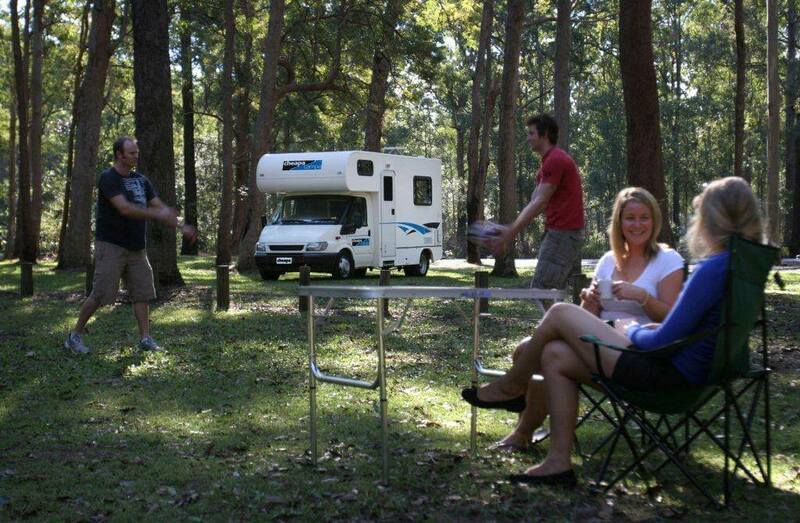 BIG 4 - Adelaide Shores Caravan Resort - With plenty of sites for caravanning and camping. Ideal base for your motorhome hire in Adelaide. Brighton Caravan Park & Holiday Village - Set right on the beach in Kingston Park with powered and unpowered sites with direct ocean views.